The authorities have made it clear that they will be keeping a close watch on social media websites and other platforms that facilitate donations to prevent misrepresentation of claims or monies being used. 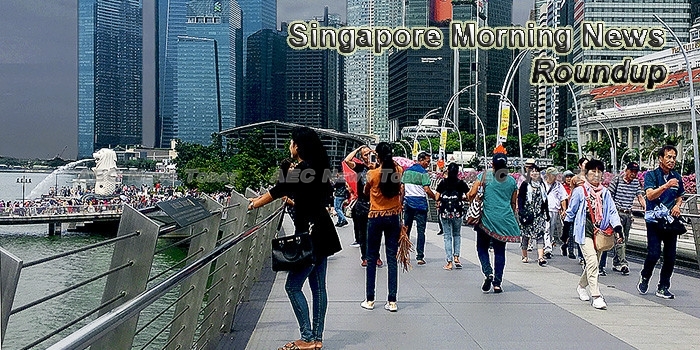 SINGAPORE businesses should make the most of India’s biggest tax reform as the country rolls out its Goods and Services Tax (GST) in July, urged International Enterprise Singapore. A STRONGER world economy boosted public pension fund, sovereign fund and central bank assets to US$33.5 trillion at end-2016, up 1.4 per cent from a year ago, according to a think tank that tracks the performance of these large public investors. The Singapore Government welcomes the National Wages Council (NWC)’s recommendations for employers to grant a built-in wage increase of $45 to $60 for workers earning a basic wage of up to $1,200. WHY WOULD A SINGAPORE E-COMMERCE COMPANY DO ITS IPO IN NEW YORK? Sea Ltd, Southeast Asia’s most valuable start-up, is prepping for a US$1 billion initial public offering in the United States, a move that would be a major pivot for Southeast Asia’s rapidly expanding tech industry. A new device, the size of a credit card and slightly thicker, is the latest tool that could improve the efforts of the public in saving the lives of cardiac arrest victims before an ambulance arrives. Singapore’s Changi Business Park will soon be home to a new cybersecurity hub, thanks to a major investment by industrial consulting firm Honeywell Process Solutions. Officials with Singapore’s National Environment Agency (NEA) confirmed Friday two cases of locally transmitted Zika virus infection at Parry Avenue. Both cases are residents in the vicinity. The SGSecure mobile application has been installed on more than 550,000 mobile devices since its launch, according to the Ministry of Home Affairs. The National Police’s Special Crimes Directorate has foiled an attempt to illegally export lobster eggs worth billions of rupiah to Singapore via Soekarno-Hatta International Airport in Cengkareng, Banten. In the first of a two-part series on the future of nursing in Singapore, experts discuss how to ensure the country has enough nurses to deal with an ageing population. Singapore is thinking of making life easy for robot advisers. The Singapore stock market has climbed higher in two straight sessions, gathering almost 25 points or 0.7 percent along the way. The Straits Times Index now rests just beneath the 3,255-point and it is expected to hold steady in that neighborhood again on Monday. If estimates are to be believed, France may have just delivered another big win for President Emmanuel Macron’s Republique en Marche party. Singapore-based Aurora Media Holdings, a media and entertainment asset investment vehicle with a corpus of $30 million, is focussed on making content as an asset class by establishing innovative and efficient media financing packages. Shares of Singapore Press Holdings Limited (SGX:T39) currenty have a 10 year dividend growth rate of -4.16%. This number is calculated using the geometric average which provides the typical value of dividend growth over the specified period using the product of their values. The geometric average is defined as the nth root of the product of n numbers. Physical activities such as the breaking of fast during Ramadan as a multi-ethnic community are significant, but because social cohesion can also be destroyed in cyberspace, radical ideas online must be countered, Minister in the Prime Minister’s Office Chan Chun Sing said yesterday.